Filippo Tommaso Marinetti. ZANG TUMB TUUM (Adrianopoli, Ottobre 1912 : Parole in Libertà.) Poesia, Milan, 1914. The kind of book you could theoretically find in the foreign language section of a doltish bookseller ignorant of modern art, poetry and European literature - plenty of chaps like that + the book is not on the net. This might trigger some sort of high pricing response and they might go for something extravagant like $375, a fairly typical bookseller's price for a book that is 'not on net.' Of course it's a marvellous piece of work by the great Italian futurist (alright he was a bit of a fascist) and remarkable for 1914. At 225 pages it is not a pamphlet but not a fat book. The BM lists two sizes 19cms tall and 28 cms tall. 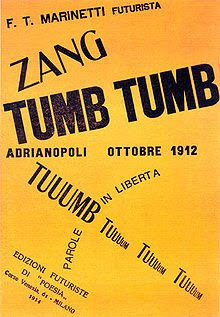 "[The] masterpiece of Words-in-freedom and of Marinetti’s literary career was the novel ‘Zang Tumb Tuuum’... the story of the siege by the Bulgarians of Turkish Adrianople in the Balkan War, which Marinetti had witnessed as a war reporter. The dynamic rhythms and onomatopoetic possibilities that the new form offered were made even more effective through the revolutionary use of different typefaces, forms and graphic arrangements and sizes that became a distinctive part of Futurism. In ‘Zang Tumb Tuuum; they are used to express an extraordinary range of different moods and speeds, quite apart from the noise and chaos of battle.... Audiences in London, Berlin and Rome alike were bowled over by the tongue-twisting vitality with which Marinetti declaimed ‘Zang Tumb Tuuum.’ As an extended sound poem it stands as one of the monuments of experimental literature, its telegraphic barrage of nouns, colours, exclamations and directions pouring out in the screeching of trains, the rat-a-tat-tat of gunfire, and the clatter of telegraphic messages"
OUTLOOK/VALUE? Futurism was in the doldrums for a while but recent records show some highish prices. An inscribed 'Zang Tumb' in slightly shabby shape made £2600 at Bloomsbury last May, a better inscribed copy sold in 1993 also at Bloomsbury (to a dealer called Gidal) for a paltry £250. Before that the Tate Gallery bought a copy for £65 just 30 years ago (also inscribed-- Marinetti was a great signer.) Meanwhile the chef d'oeuvre of Futurism, albeit after the event (1932) 'Parole in Liberta Futuriste Olfattive Tattili Termiche' sometimes known as 'the tin book' (see below) made $70,000 in 1993 and the BM bought a copy this year for a generous £83000. It consist of 15 thin metal sheets in various colors and will be on display. This price was paid to another institution and rather like collector-to -collector sales may have been toppish especially in these times. 25 years ago it sold for £4000- a sound investment. At the risk of appearing 'ignorant of modern art, poetry and European literature', with red face I admit that until minutes ago I thought of Zang Tumb Tuum only as as the label that gave us Art of Noise, Propaganda and Grace Jones' 'Slave to the Rhythm'. Ah, I was so young then... and the music seemed so dramatic. Ah yes ZTT --by the by Futurist cookery also had a darker side: the Fascists in the mid 1930s, mindful of the need to reduce expensive imports of wheat needed to produce pasta, took up the idea that pasta was not a suitable food for fighters and heroes, and instead promoted locally-grown rice as a preferred substitute. Didn't really work. This post could indeed be much improved by a link to the first music video played on MTV, or at least Trevor Horn in ridiculous shorts. In comparison to the number of Italian futurism collectors, there are at least as many musos buying records in this price range who might well snap up a copy of the inspirational manifesto of their favorite record label. Ignoring them is simply bad business. Oh, the interior of a full metal Futurist book. 'scuse me--need a moment... Ah thanks. 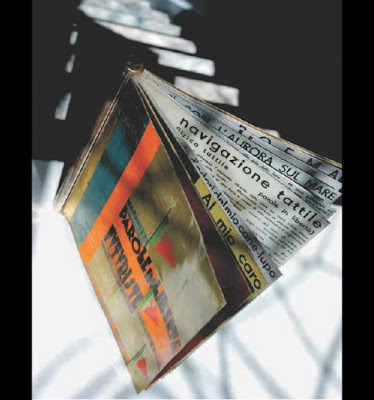 Did you see the paper bolted Futurist book and the SF antiquarian show? Major bookgasm over that (pity it cost more than my car) and the later manifesto in the case.